The rise of platform companies that make use of new technology may disrupt traditional jobs, but will also create new ones for professionals, managers, executives and technicians (PMETs), said panellists at the STJobs Career & Development 2017 job fair yesterday. Platform companies connect customers and services in digital ways, such as via mobile apps or websites. One example is local start-up ShopBack, which gives people cashback for shopping online while directing shoppers to merchants through its site. Its co-founder Joel Leong said that people can adapt to the new jobs created by firms like his, by figuring out how to adapt their core skills to a new platform. For example, marketers in a tech company have the same core aim as those in traditional companies: getting consumers to use a product. "For a physical product, marketers have to let you try it, so they might have roadshows. 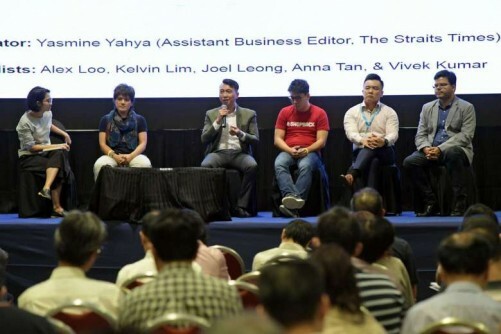 But a tech product is different, and they have to use different ways like Facebook and Google to reach out," he said at the fair organised by STJobs and the National Trades Union Congress (NTUC). "These jobs are all about the same, just that the platform they are used for is slightly different." Mr Leong was one of five panellists talking about how the rise of platform companies will affect PMETs, in a discussion moderated by Straits Times assistant business editor Yasmine Yahya. PMETs are the group deemed most vulnerable to losing their jobs to smart technology or machines, and to cheaper and more competitive workers overseas. The Government has gone big on schemes to help them switch sectors and find new jobs. NTUC assistant director-general Vivek Kumar said the old mindset of getting a degree "to last our working lifetime" is outdated. Instead, PMETs need to be ready to deal with ambiguity and uncertainty, and must be willing to acquire skills along the way. Other panellists talked about becoming entrepreneurs and how PMETs can take the initiative to add value to their company. Mr Chan Chun Sing, Minister in the Prime Minister's Office and NTUC secretary-general, also held a closed-door dialogue with participants at the fair.